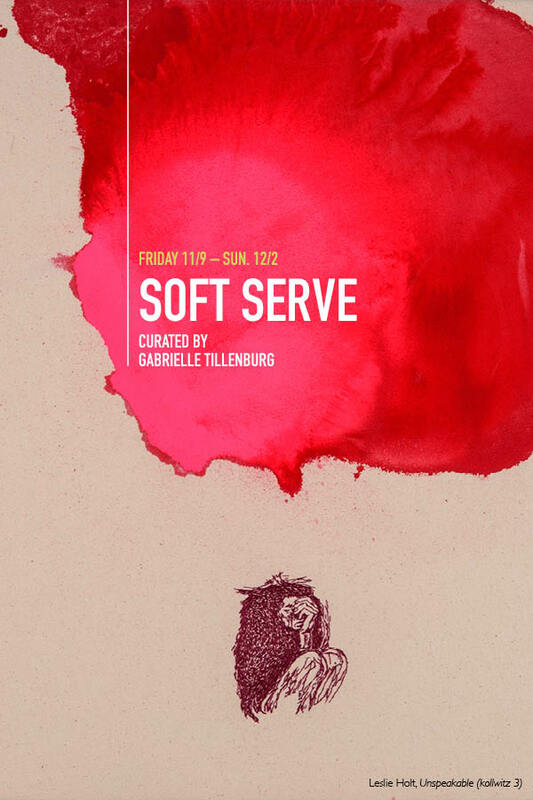 Soft Serve examines the use of fiber arts to explore hard experiences unique to identities commonly pigeonholed with ‘soft’ qualities. Societal notions of femininity have the ability to influence ways of being. Expectations of the feminine to encompass agreeability, grace, and warmth are also met with stereotypes of weakness and fragility. When facing difficulty, these qualities, whether learned or rejected, inform our response, for better or for worse. Being that fiber arts have a history of being labeled as “women’s work,” are literally soft, and are also associated with the use of fiber to care for the body (warmth and coverage), the medium offers a unique approach to exploring these topics. Each artist explores a difficult experience at a different stage of life. Alanna Reeves explores the effects of cultural stereotypes encountered in early childhood through an interactive piece inspired by paper dolls. Sasha Baskin adopts imagery from the reality-TV show The Bachelor for her weavings studying ways in which rejection in the pursuit of love are commodified for public consumption. Verónica Casado Hernández utilizes embroidery to examine the married lives of women under fascist regimes, drawing parallels between oppression and prescribed gender roles. Leslie Holt incorporates embroidered images of women from Picasso’s Guernica and other artworks, both tender and in despair. She presents the duality of the beauty and inelegance of mortality and grief. Together, the works ask the question - what does it mean to be soft in a hard position? ​Weaving and Grieving invites the public for a group discussion and weaving activity. Participants will have the opportunity to share stories and sentiments on their own grief, or grief in general, how it is symbolically woven into our daily lives, and how gender socialization influences our own grieving processes while creating a unique weaving to contribute to a group work. All materials will be provided and participants are welcome to bring any personal yarn they'd like to use. All events are free and open to the public.